PM Rugunda (C) chats with Gulu Municipality MP Lyandro Komakech (L) and Gulu Women MP Betty Aol at Pece Stadium yesterday. David Okema. 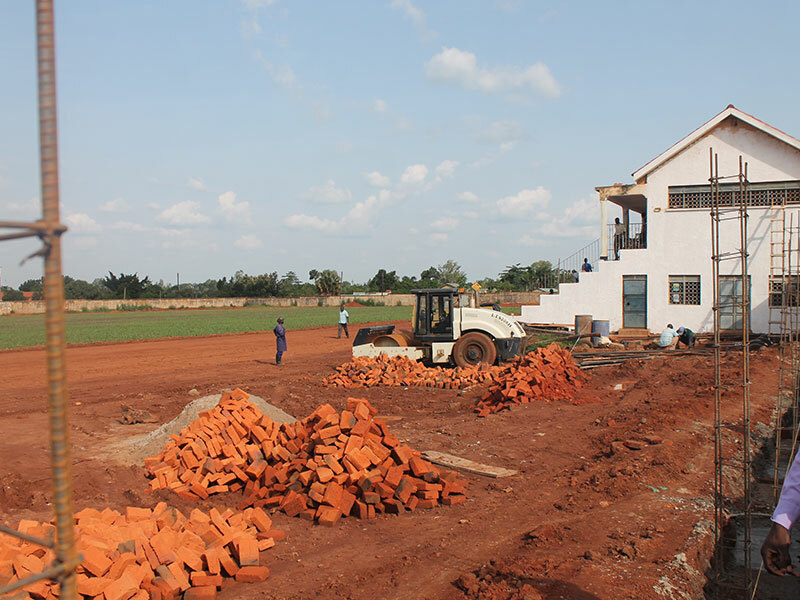 GULU– Prime Minister Ruhakana Rugunda has assured Gulu local leaders that Pece Stadium will be ready to host the East African Secondary Schools Games when the competitions start on August 17. 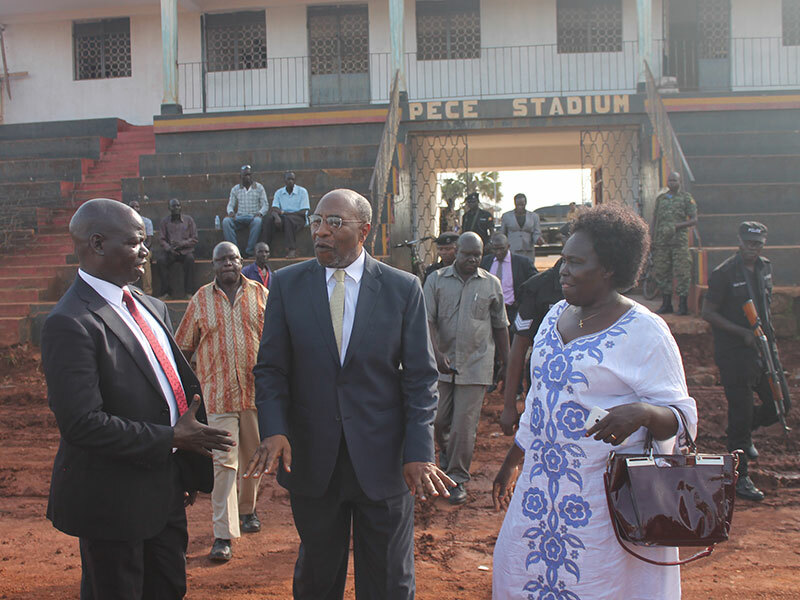 Premier Rugunda was on Tuesday visiting Pece Stadium in response to Gulu District Chairman Martin Ojara Mapenduzi”s appeals for the Government to step in and bail the local government’s efforts to have the facility and other host venues ready before he games open. “There is no way this playground would be like this in August. 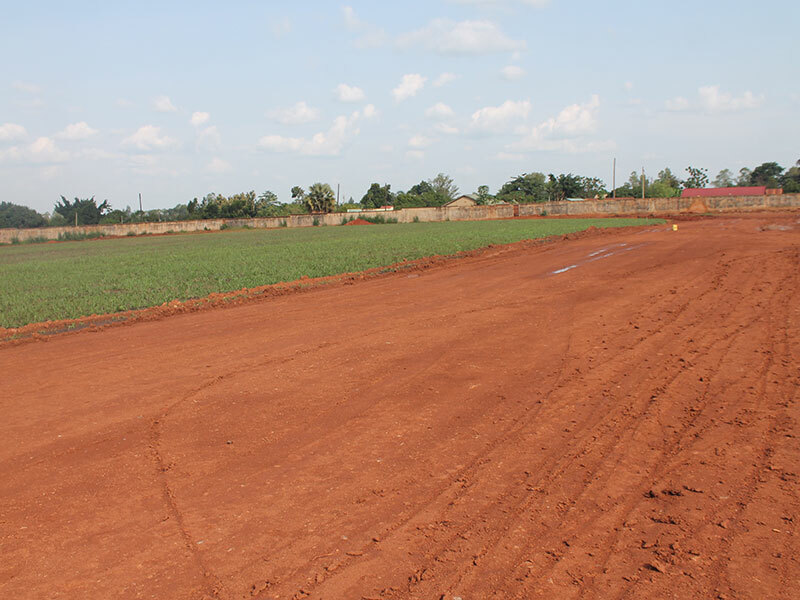 We have no choice it is no longer an issue of Gulu Municipality or Gulu people it is Uganda now and Uganda has no choice but to prepare the ground,” Rugunda said while touring the facility whose refurbishment looks like it has just started more than two months later. Mapenduzi told the prime minister during a signing of Memorandum of Understanding between Japenese city and Gulu municipality that the renovation of Pece War Memorial Stadium alone requires between Sh150 million and Sh200 million to erect perimeter wall fence, water pump, washrooms, compacting the track runway and other utilities. The stadium will be the main host venue while Sacred Heart School, St Joseph College, Layibi, and other grounds will offer support for spill-over games. Sacred Hearts, in particular, will house the participating teams and thus needs its dormitories refurbished as well, while Layibi will host swimming competition. PM Ruganda said he would convene a meeting with Gulu local government officials, Members of Parliament as well as Education ministry officials to chart how to speed up the refurbishment process as it is a run against time. “I believe a solution will be found,” Rugunda said, promising to talk to the Minister of Education and Sport, First Lady Janet Museveni, firsthand to ensure immediate response as far as preparation for the game is concerned. In June, Mapunduzi told PML Daily that the district had taken over the rehabilitation work from the Board of Trustees and War Veterans Association –who were the custodians of the stadium. A team from the district engineering office carried out an assessment and came up with a budget of Shs360 million that the district was canvassing. At the time, the district had constituted a committed to oversee the rehabilitation process with a fully-fledged finance committee as it called for financial contributions from well-wishers. But Mapinduzi says the contribution made by the community, organisation and well-wishers is not yet enough. The shortage of funds, he added, was affecting progress of the works. Yesterday, dfcu bank donated 1,000 bags of cements to raise the perimeter wall fence. Among other contribution since the work started in May, World Embrace donated Sh36.2 miillion, Watoto Church Sh35 million, Orial Investment Sh10 million, Bank Of Africa Sh10 million, Gulu University Sh5 million, Mega Fm Sh1.5 million as well as other funds from the community. “A thousand bags of cement is a very big contribution, but we still need sand, bricks, sand aggregate; we need a lot of other items and we will be reaching many other people to join us in this endavour,” Mapinduzi said. At least 5,000 participants from the Rwanda, Burundi, Tanzania, Uganda, South Sudan, Kenya are expected to converge in Gulu for the East Africa Secondary School Games in August. The games will include athletics, football, badminton, swimming, and basketball and will be played in about seven different venues depending of the category. The venues include Kaunda Ground basketball court, St Joseph Layibi for football and swimming, SOS Children Village playround for badminton, Pece War Memorial Stadium for track and field events, Gulu High School for football. among others.